Aaron was one of our community's best and brightest, and he acheived great things in his short life. He was a coder, a political activist, an entrepreneur, a contributor to major technological developments (like RSS), and an all-around Internet freedom rock star. As Wired noted, the world will miss out on decades of magnificent things Aaron would have accomplished had his time not been cut short. Over the past two years, Aaron was forced to devote much of his energy and resources to fighting a relentless and unjust felony prosecution brought by Justice Department attorneys in Massachusetts. His alleged crimes stemmed from using MIT's computer network to download millions of academic articles from the online archive JSTOR, allegedly without "authorization." For that, he faced 13 felony counts of hacking and wire fraud (pdf), which carried the possibility of decades in prison and crippling fines. His case would have gone to trial in April. The government should never have thrown the book at Aaron for accessing MIT's network and downloading scholarly research. However, some extremely problematic elements of the law made it possible. We can trace some of those issues to the U.S. criminal justice system as an institution, and I suspect others will write about that in the coming days. But Aaron's tragedy also shines a spotlight on a couple profound flaws of the Computer Fraud and Abuse Act in particular, and gives us an opportunity to think about how to address them. Among other things, the CFAA makes it illegal to gain access to protected computers "without authorization" or in a manner that "exceeds authorized access." Unfortunately, the law doesn't clearly explain what a lack of "authorization" actually means. Creative prosecutors have taken advantage of this confusion to craft criminal charges that aren't really about hacking a computer but instead target other behavior the prosecutors don't like. An obvious problem with this argument is that it would mean anyone who runs afoul of a web site's fine print is a criminal — and many of us intentionally or unintentionally violate those agreements every day. Prosecutors wouldn't bother filing criminal charges against most of us, of course. But if they wanted to, they would have the leeway to do it under the government's theory. But other criminal defendants haven't been so lucky. In November, a jury convicted Andrew Auernheimer after someone else wrote a script to collect thousands of iPad owners' email addresses — which AT&T had failed to secure. Auernheimer's involvement in the "hack" appears to have been primarily telling journalists about the vulnerability after the fact (pdf). He plans to appeal the conviction. It's possible that Auernheimer's unsympathetic reputation as an Internet troll played a role in the government's decision to indict him. And the CFAA's vague and overbroad language gave the jury an excuse to punish someone who didn't carry out anything remotely resembling a serious computer intrusion, even though that's the concern that caused Congress to criminalize "unauthorized" access in the first place. Let's be clear: being an unsympathetic person is not a computer crime. Most of the government's charges against Aaron alleged "unauthorized" access. We'll never know exactly how prosecutors planned to argue at trial that Aaron's access to JSTOR and the MIT network was "unauthorized." However, the allegations in the indictment suggest the case was based at least in part on the idea that Aaron violated JSTOR and MIT's network rules and user agreements. Under Drew and more recent precedent(pdf), that theory of criminal liability is dubious at best. The Justice Department's press release announcing Aaron's indictment suggests the true motivation for pursuing the case was that Aaron downloaded academic literature from JSTOR and planned to make it available to the public for free as a political statement about access to knowledge. According to United States Attorney Carmen M. Ortiz, "Stealing is stealing whether you use a computer command or a crowbar, and whether you take documents, data or dollars. It is equally harmful to the victim whether you sell what you have stolen or give it away." And the CFAA's vague language and broad reach helped to give the government the means to bring a criminal prosecution, even though the situation would have been better resolved privately among Aaron, JSTOR, and MIT. It's time for Congress to amend the CFAA to clarify what counts as access "without authorization" and what doesn't. This will help ensure prosecutors can't use the law to bring arbitary cases against people they simply don't like. The penalty scheme for CFAA violations is harsh and disproportionate to the magnitude of offenses. Even first-time offenses for accessing a protected computer "without authorization" can be punishable by up to five years in prison each (ten years for repeat offenses) plus fines. It's worth nothing that five years is a relatively light maximum penalty by CFAA standards; violations of other parts of that law are punishable by up to ten years, 20 years, and even life in prison. When Aaron was first indicted on four felony counts, the Justice Department crowed that he was facing 35 years in prison and a million-dollar fine. Last fall, the government upped the ante and re-indicted Aaron on 13 counts. Eleven counts were CFAA offenses, some of which were "unauthorized" access claims and some of which were alleged violations of other parts of that law. Each CFAA count was punishable by a maximum of five years of prison time. He was also indicted on two wire fraud counts, each of which carried a maximum of 20 years. According to the Wall Street Journal, the government indicated shortly before Aaron's death that it "might only seek seven years at trial." That number pales in comparison to what prosecutors could have exercised their discretion to seek, and what the law would have permitted a court to impose. But seven years is still a very long time, and a wholly disproportionate penalty for Aaron's alleged actions. As if the law's current magnitude of punishment isn't overwhelming enough, Congress has been thinking about beefing up the CFAA, which the Justice Department fully supports (pdf). Both the House and Senate considered legislation last year that would expand the reach of the statute and make its penalties even more severe. These are terrible ideas, especially in light of the "unauthorized" access problem discussed above. The specter of being incarcerated for years should never have haunted Aaron, but it did. Brilliant, talented, visionary people should be spending their time building our future, not worrying about wasting away in prison. Congress must update the CFAA to ensure the penalties actually make sense in light of the behavior they're meant to punish. Please join us in calling on Congress to change the law today. Click here to send a note to your elected officials today. Aaron was a powerful force for change, and he would still be working toward that goal if he were here. 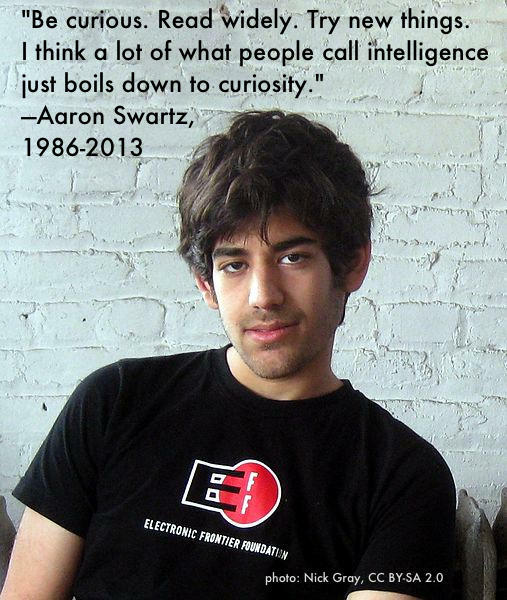 His memory should challenge us to make the Internet, the law, and the world better. One place to start is the CFAA.